Not sure if it is the best brewer for you? Read our Ninja Coffee Bar reviews to make the right buying decision. Ninja coffee makers are the newest trend in the coffee industry and they come with the best of features in speciality coffee brewing. Most of the ninja coffee bars are budget-friendly options and is an ideal choice for coffee lovers. There are a variety of models in the market to choose from and it depends entirely on you which attributes you prefer more than others. Keeping all the necessities of a coffee lover, we have listed down the top ninja coffee bars in this review guide for you, making it easy for you to choose from a plethora of options. CF097 is an upgraded model of the popular CF085Z which comes with up to date technology and newer features to simplify your coffee making process. The Cafe Forte 097 comes with a detachable reservoir, along with the basic thermal flavour extraction. If you are the kind who enjoys different flavours and blend to your coffee, then this one from Cafe Forte is exactly for you. 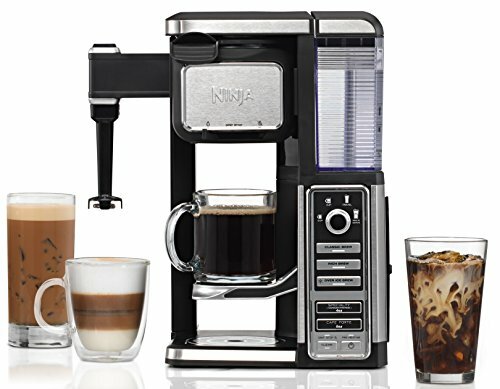 It comes with dynamic inbuilt functions which provides you with the option of making anything from cold coffee to hot coffee to iced coffee. They are ideal for office as well as home use. It comes with a stainless steel carafe that is thermally insulated allowing you to keep your coffee heated for longer period. You have the option to brew iced coffee within a short period with the Ninja Over Ice Carafe. If you want your brewing process to be as simple as possible, you also have the auto-iQ one touch intelligence. Whenever your coffee bar would need descaling, a clean light will turn on. 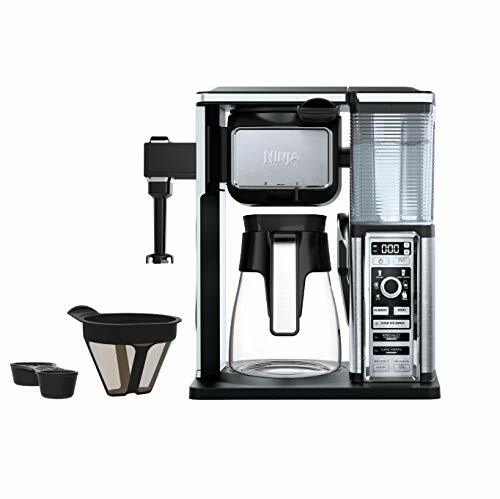 The Cafe Forte 091 model is a beautiful and sleek coffee bar that comes in a brilliant glass carafe system. It is the talk of the town! It is easy to use and is convenient to control this coffee bar which is why it is second in our top 5 list of ninja coffee bar. You can make up to 10 cups of coffee at one time which makes it ideal for office or big families. 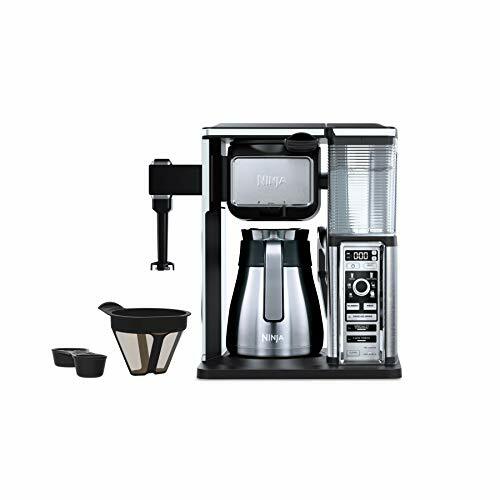 This one is a signature brewing system from Cafe Forte that allows you to make strong coffee that is uniquely flavoured in taste. The side of the machine has an in-built frother for those who like extra foam in their coffee. This single-serve coffee bar is for those who love enjoying their coffee alone. It comes with a lot of interesting features and is simple and minimalistic in its built up. You can experiment with different kinds of brewing techniques with this coffee bar, even make the kind of coffee that Starbucks does. It comes with a multi-serve ninja hot and cold tumbler depending on how you like your coffee. For those who love foam in their coffee, it also comes with a ninja hot and cold in-built frother. For those of you who like strong coffee, it is built with an advanced thermal flavour extraction technology. It is sturdy in its design and comes with a warranty of 1 year. If you want a productive coffee machine that comes with all the basic required features but do not want to spend big on it then the 085Z model from Cafe Forte is the right option for you. It has a technique of heating the water at the required temperature and then soaking the warm water over the coffee grounds. This coffee bar can keep your coffee hot for up to 2 hours, thanks to its stainless double walled carafe that is also thermally insulated. It first saturates the beans and then starts the cycle of brewing that makes it similar to pour over coffee maker. It is tall in its built up and is ideal for even small kitchens. 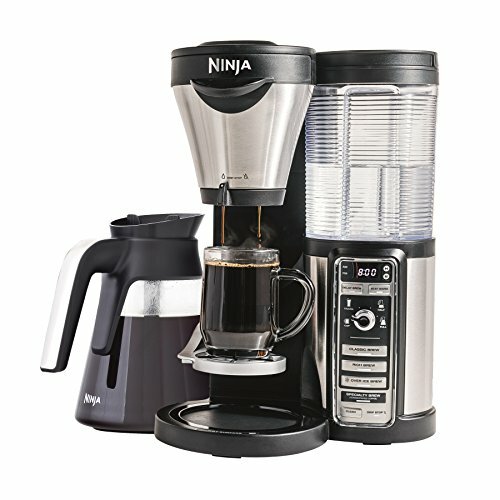 This ninja model comes with a glass carafe system and has an in-built hot and cold insulated tumbler. It is not very expensive though it is not below budget as well. It is easy to use and flexible as well, which is why it is in this list of ours. You won’t have a regret buying this model from Cafe forte, we can vouch for it! You can keep your coffee at a convenient temperature with the temperature warming plate. This model comes with a ninja hot and cold insulated tumbler so you can even take your coffee with you when traveling. The detachable water reservoir is dishwasher friendly and is easy to clean. The classic coffee brew is ideal for those looking for classic, smooth and rich in taste hot coffee. The rich brew is slightly more robust in taste and is perfect with extra cream or milk over it. Over ice brew is enjoyed with ice over coffee and is refreshing in its taste, without making it too watery. Signature brew such as latte or cappuccino are unique flavours that is desired by choosy coffee drinkers. Nowadays all ninja coffee bars comes with frothing capability in both hot as well as cold frothing. This makes the coffee smoother and tastier and adds the right blend to the milk as well. A little froth over your coffee can make your coffee silkier and more tempting. This is one of the most important feature in a ninja coffee bar. This makes it convenient for you to choose the size of your coffee and doing it is just a click away. The thermal flavor option allows you to experiment with all kinds of brew from iced to classic to signature. With this feature, you can draw exactly the required quantity amount of water for your coffee. Thermal Carafe: Thermal carafes are made of stainless steel and is mostly double walled to keep the coffee warm up to a couple of hours. Glass Carafe: This comes with a warming plate that allows you to keep the coffee warm at the required temperature. All ninja coffee bars come with a permanent filter which is fitted inside the brew basket. It can be used again and again every time you make coffee for yourself. A lot of options in the market can confuse you, here are a few prerequisites that will help you decide which model of Ninja Coffee Bar will be ideal for you. First and foremost choose a budget for yourself, this will help you filter out the options that are way above your decided amount. When you set your budget, it will also prevent you from overspending or making any impulsive choice and then regretting later. There are technically two types of carafe as discussed above – glass and thermal carafe. While thermal carafe system stores your coffee warm for a longer period, glass carafe also keeps your drink warm for considerably long time and also lets you see through the glass. What model you choose depends on how much coffee you brew daily. Coffee makers come in different sizes and can brew different quantity. You can easily brew somewhere between 4 to 20 cups depending on the size of the coffee bar. If you want a coffee bar that will brew coffee only for yourself, go for a single serve coffee bar. And if you are looking to brew coffee for a big family then go for a carafe coffee maker. Before you start to use your coffee bar, here are a few details that you need to know about that would help you for your daily brewing process. Descaling Your Coffee Maker: It is very very important to keep your coffee machine clean and do deep cleaning every once a while or else it could be a breeding ground for bacteria that could also affect the taste of your coffee, making it bitter in taste. Coffee Grounds To Use: Whether you use a single serve or a carafe system, the taste of your coffee will come from the coffee grounds you use. So, ensure that the grounds are of good quality and you use only the amount required for the purpose and not more than the required amount. Read The Manual: When you start brewing with your Ninja coffee maker, begin by reading the instruction manual so as to ensure that you are using it safely. Once you become acquainted with how to use it well, you can experiment with it depending on how you want to blend your coffee. Brew Basket And Paper Filter: In case you wish to use paper filter, make sure you remove the permanent filter and keep it clean after every use. Once you have used the paper filter dispose it and do not keep it inside the basket for too long after usage. 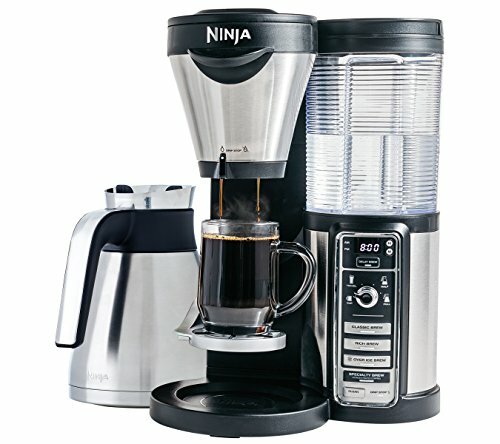 We hope this Ninja Coffee Bar reviews has been helpful to you to decide on the coffee maker you want to buy. Keep in mind your drinking habit and how often you brew coffee and likewise decide on the model. If you have more queries or thoughts, just drop in your lines in the comment section below and we will be happy to answer them for you.